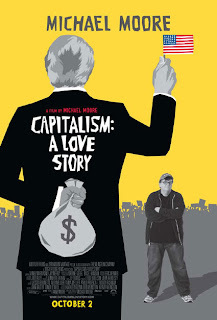 A close friend recently invited me over to see a private screening of Michael Moore’s new film, Capitalism: A Love Story. I was excited to see a “mainstream” film that was backed by big Hollywood bucks conclude capitalism is “evil.” Arguably the most successful documentarian ever -- a man who has made millions of dollars -- was going to legitimately make the case that there was an alternative to capitalism. I sat down in a packed theatre, eager to see how his vision could possibly flesh out. Moore is a rather simple guy. He is likable. He sees the world as good guys (people with no money) and bad guys (people with money). His Flint, Michigan, union-worker upbringing is at the heart of his perverted worldview. If you did not have that upbringing or if your life started less severe than his, you are an evil capitalist. If, on the other hand, you are a laid-off factory worker with a sixth-grade education, you are a true hero. I don’t care one way or the other that he has that view and I am not knocking union workers, but Moore sees the world through a class-warfare lens resulting in a certain agenda: force wealth to be spread amongst everyone regardless of effort. Within minutes it was clear where Capitalism: A Love Story was headed. We listen to heartbreaking stories of foreclosed families across America -- but we don’t learn why the foreclosures happened. Did these people treat their homes as piggy banks? Was there refinancing on top of refinancing just to keep buying mall trinkets and other goodies with no respect to risk or logic? We don’t find out. We meet one family that is so desperate for money that they were willing to accept $1,000 for cleaning out the house that they were just evicted from. Was it sad? Yes. But should we end capitalism due to this one family in Peoria, Illinois? We are introduced to a guy whose company, called Condo Vultures, is buying and selling foreclosed properties. Since he acted like a used car salesman, the implication was that he was an evil capitalist. However, Moore doesn’t tell us if his buyers were “working-class” people making smart buying decisions after prices had dropped. We listen to Catholic priests who denounce capitalism as an evil to be eradicated. What would they put in its place and how would the new system work? The priests don’t tell us. We learn that Walmart bought life insurance policies on many workers. We are then told to feel outrage when Walmart receives a large payout from an employee death while the family still struggles with bills. I saw where Moore was heading here, but is this a reason to end capitalism? We hear a story from a commercial pilot so low on money that he has to use food stamps. Moore points out that many pilots are making less than Taco Bell managers and then attributes a recent plane crash in Buffalo to underpaid pilots. This one crash is extrapolated as yet another reason to end capitalism. I was pleasantly surprised at Moore’s attempt at balance. For example, he included a carpenter who, while boarding up a foreclosed home, says, “If people pay their bills, they don’t get thrown out.” There is also a dressing-down of Senator Chris Dodd by name. Moore called out a top Democrat? He sure did. He nailed him. There is a lengthy dissertation on the evils of Goldman Sachs. He rips Robert Rubin and Hank Paulson big time, and I agree with him. In fact, I said to myself, “Moore, you should have done your whole film on Goldman Sachs!” Throughout the various stories and interviews he also weaves a conspiracy theory (all Moore films do this). The plot goes something like this: America won World War II and quickly dominated because there was no competition (Germany and Japan were destroyed). We had great postwar success where everyone lived in union-like equality. Jobs were plentiful and families were happy. However, things started to go bad in the 1970s -- here Moore uses a snippet of President Carter preaching about greed. This clip was predictably building to Moore’s big reason for all of today’s problems: the Reagan Revolution. Moore sees Reagan entering the scene as a shill for corporate-banking interests. However, everyone is happy as the good times roll all the way through into the Clinton era. Moore does take subtle shots at President Clinton, but nails his right-hand economic man, Larry Summers, directly as a primary reason for the banking collapse. While Moore sees Japan and Germany today as socialistic winners where corporations benefit workers more than shareholders, he sees America sinking fast. So is that it? That was the proof that capitalism is an evil to eliminate? Essentially, yes, that’s Moore’s proof. What is his solution? Tugging on your idealistic heartstrings of course! Moore ends his film with recently uncovered video of FDR talking to America on January 11, 1944. Looking into the camera, a weary FDR proposed what he called a second Bill of Rights—an economic Bill of Rights. As FDR concluded and the film ended, I was shocked at the reaction. The theater of 400-plus spectators stood and cheered wildly at FDR’s 1944 proposal. The questions running through my head were immediate: how does one legislate words like useful, enough, recreation, adequate, decent, and good? Who decides all of this and to what degree? Interestingly, during the Q&A, Adriana Huffington and Michael Moore discussed bank-failure fears during the fall of 2008. They asked for a show of hands of how many people moved money around or attempted to protect against a bank failure. I had the only hand that went up. Figuring someone else must see the problems with this film, I started poking around the net for other views. One critic declared that the value of the film was not in the moviemaking, but in its message that hits you in the gut and makes you angry. This film did not make me angry, but it did punch me in the gut. The people in that theater, including Moore, were not bad people. They just seem to all have consumed a lethal dose of Kool-Aid. At the end, Moore pushed the audience to understand that while they don’t have the money, they do have the vote. He implored them to use their vote to take money from one group to give it to another group. Did he really say that openly with no ambiguity? Yes, sadly. Deze recensie van Michael Covel verscheen oorspronkelijk in het maandblad "The Free Market" en werd ook elders overgenomen. Meer recensies van hem op www?thefreemarket.org.